DJAM is located in the building of the Polanentheater in Amsterdam-West nearby the Westergasfabriek. DJAM has at its disposal a classroom for combolessons and a classroom for theoretical lessons. In addition for APM we utilize another bigger room. The cafeteria is open for coffee, tea and other refreshments during DJAM lessons (and also, of course, during performances). The atmosphere is informal. During breaks and free periods, DJAM students are often found at a table or behind a newspaper, in a discussion or immersed in a bit of music theory. 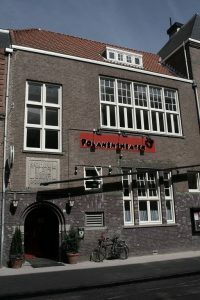 The Polanentheater focuses primarily on cabaret, music events and children’s theatre, thereby giving budding professionals in the theatre a chance to take the stage. For more information go on the internet to: www.polanentheater.nl.